Chill 2 bottles to different temperatures at the same time! Dinner for 2 or a gathering of many, the Chambrer Wine Bar is the Perfect beverage chiller for your next occasion. The Wine Bar accommodates any size beverage, from beer cans to champagne bottles. 1) Insert bottle into chamber. 2) Select ideal temperature, chill then serve. Super cool your bottles. The same power as your freezer is in a compact counter-top package. Use to chill bottles of liquor, pop, cocktail mix, carbonated water or any other beverage that requires chilling. 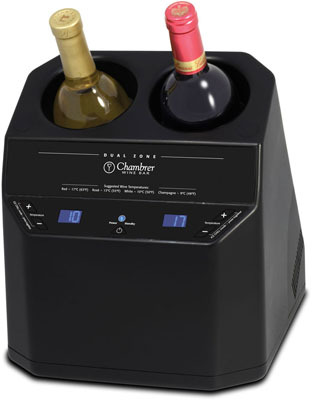 Nothing changes the taste of wine, beer and spirits more than temperature. Some wine makers are recommending serving temperatures on their labels so you can enjoy their wine at its best. Spirits (Vodka, Rum, Blends, etc.) benefit from being served chilled enhancing their smoothness and taste. Note: Height with bottles depends on bottles, therefore measurement is approximate.